The marked presence of eastern spiritual ideas in the religious imaginings of western peoples is a significant feature of the faith landscapes of contemporary societies. Yet sociological knowledge of eastern spirituality among western constituents remains comparatively undeveloped. 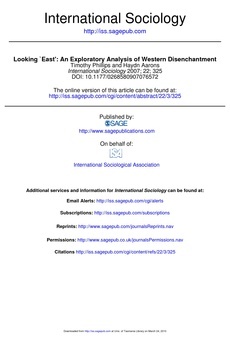 The study proposes it is sociologically useful to think about involvement with eastern spirituality as a particular expression of disenchantment with the West. The research examines the plausibility of this approach by reporting and reflecting on the results of an investigative quantitative study of individuals involved with eastern spirituality. The findings show that individuals engaged with eastern spirituality were more deeply disenchanted with a western self-identity than people in general. Furthermore, the results suggest that among the involved, the most disenchanted favoured a particular style of eastern practice. For these adherents, dedicated practice without belonging was the preferred mode of engagement with eastern spirituality. This result might be seen to point to the presence of a manifest ambivalence among the heavily disenchanted towards Orientalist practices of classifying and categorizing `the East'. More generally, the study suggests how modern individuals respond to identity imbalance between being western yet not feeling western as an important sociological question in the current era.